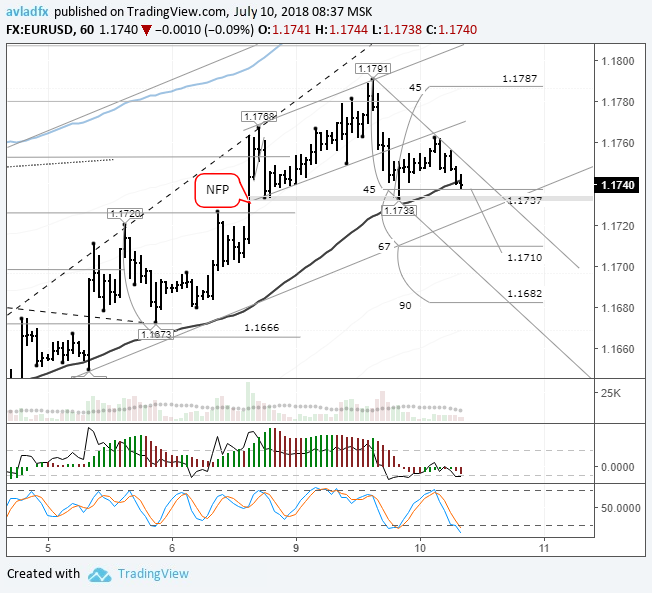 Forecast and technical analysis EURUSD on July 10, 2018. On Monday the 9th of July, trading on the euro closed slightly up. And after a drop in the American session, a long wick formed on the daily candlestick, a sign that the market is transitioning into a bearish phase. During the US trading session, the euro rose to 1.1791 against the background of a general weakening of the dollar and growing euro crosses. The upwards correction in relation to the dollar began with the collapse of the British pound. The pound came under pressure because of British Foreign Secretary Boris Johnson's resignation. The pound has fallen against the dollar by 150 pips to 1.3189. Investors perceived the resignation of two government ministers as a split in the ruling Conservative Party of Great Britain on the terms of exit from the EU. The euro depreciated to 1.17333. 11:30 UK: GDP (MoM) (May), industrial production, industrial manufacturing, total trade balance (May). 12:00 Germany: ZEW survey - economic sentiment. 14:00 UK: NIESR GDP estimate (3M) (Jun). 15:15 Canada: housing starts s.a. (YoY) (Jun). 15:30 Canada: building permits (MoM) (May). 17:00 US: JOLTS job openings (May). Buyers were able to push the price to 1.1791. From there it fell to the lb balance line, where it intersects with the 45th degree, strengthening the support at 1.1738. The euro is currently trading at 1.1742. The trend line passes through 1.1724. Technically, nothing is stopping sellers from testing it before the opening of the US session. The dollar and euro crosses are showing mixed dynamics. The stochastic oscillator is in the purchase zone, signalling that the correction may drag out a few hours before the sellers advance. Based on this forecast, I'm waiting for a breakout of the trend line and the 67th degree to 1.1710. Of all of the day's news, it's worth keeping an eye on British data.